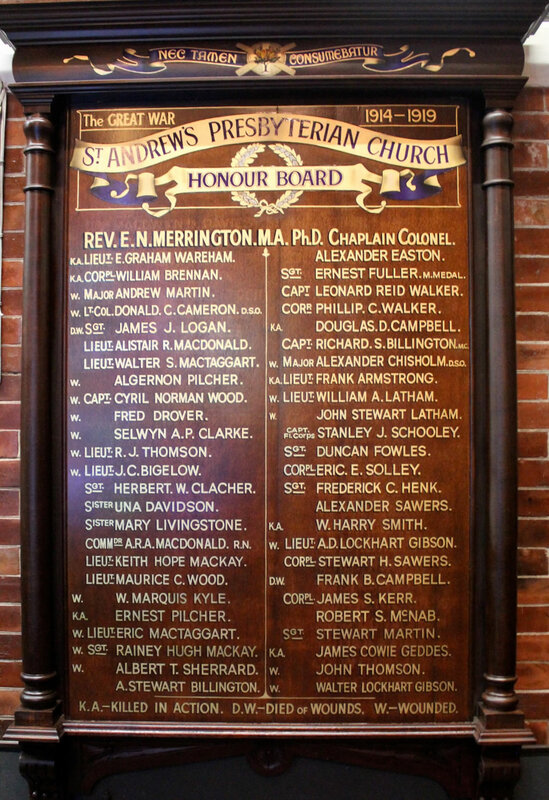 The names of Lieutenant Walter S Mactaggart and Lieutenant Dan Eric Mactaggart are printed in gold lettering on a Saint Andrew’s Presbyterian Church Honour Board at Saint Andrew’s Uniting Church. They were respectively the eldest and youngest children of Daniel and Florence Rosalie Mactaggart of Ascot in Brisbane. The other four children were girls - Jeannie, Florence, Marjorie and Dora. They all attended Saint Andrew’s. Presbyterian Church. Daniel Mactaggart was a pioneer in the beef fattening industry in the Burnett and Mary Valleys and founder in Maryborough of the stock and station agency which still bears his name. He took a strong interest in the sport of rowing in Maryborough. When Maryborough was linked by rail to Brisbane, Daniel Mactaggart and his brother opened a branch of Mactaggart Brothers Limited in the capital where the firm prospered. Mrs Mactaggart came from Victoria and her marriage took place in Maryborough, Queensland before the family moved to Markwell Street, Ascot in Brisbane in 1892. A home and garden lover, the cares of her family of four daughters and two sons were her principal interest though she was a keen supporter of the Presbyterian Church. Through her husband she became closely identified with the pastoral interests of the State. Their sons, Walter and Dan returned from service in Europe though both suffered the harmful effects of gassing. Daniel Mactaggart was Governing Director of Mactaggart Brothers Limited when he died in 1924, aged 71 years. Mrs Mactaggart died fourteen years later. Dan Eric Mactaggart was born in Brisbane on 17 July 1896. He attended the Brisbane Grammar School from 1910 till 1912 where he had received military training in the Senior Cadet Corps. He furthered his education at Scotch College, Melbourne where he took a keen interest in rowing and served in the Melbourne University Rifles. He was a stockman jackaroo on Bundooma on the Burnett River. He enlisted at the age of 20 in Brisbane to serve overseas in the Australian Infantry Force on 4 August 1916. Gunner Dan Eric Mactaggart, Regimental Number 31905, joined the 9th Field Artillery Brigade Reinforcements, embarking from Sydney on RMS Osterley on 10 February 1917 and disembarking at Plymouth on 11 April. He proceeded overseas to the Western Front where he was engaged in heavy battle at Ypres, Menin Road, Passchendaele and Zonnebeke. He was forced to receive hospital treatment however in England over a period of three months because of the effects of shell gas. He was transferred in July 1918 to the Australian Flying Corps and gained commission as Lieutenant. He was based at depots in England over ensuing months. His appointment was terminated soon after his return to Australia per Prinz Ludwig in October 1919. Eric Mactaggart rejoined his firm and after it was made into a cooperative association he became Managing Director, a post he retained until his death. On 3 February 1925 at St James Church, King Street, Sydney, Eric Mactaggart married Maisie Eileen Rylance of Vaucluse. Vicar General Archdeacon D’Arcy Irvine officiated. They made their home in the Brisbane suburb of Hendra. Mr Mactaggart who was President of the Fat Stock and Produce Brokers’ Association for 14 years took a keen interest in the production side of the industry. He was also Chairman of Rylance Collieries and Brick Works. One of his principal hobbies was developing his grazing property, ‘Cowah’ at Kilcoy to which he had hoped to retire. He died on 2 July 1956, aged 59. He was survived by his wife, a daughter and one son. Mrs Mactaggart died in 1982.